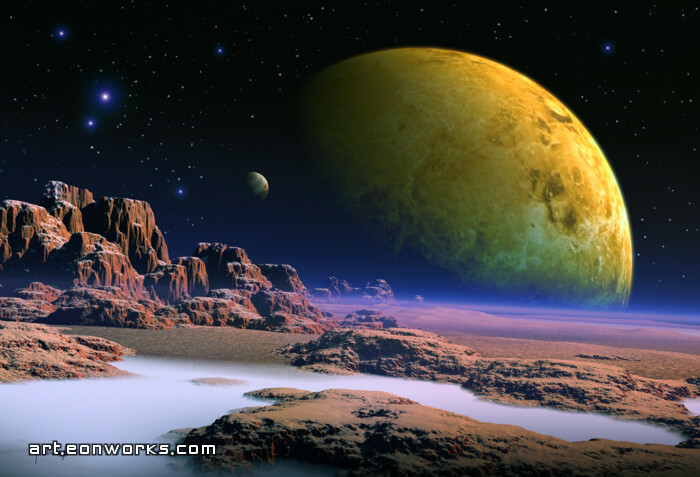 I once received an email from a person who thought that my space artwork were actual photos of vistas from real planets, and he asked what telescope and camera I used. I replied that I did not use a telescope and that the pictures in the space gallery are created based on imagination. Then I thought that perhaps some day there will be a technology that will let us look at any planet in the universe to see how its landscapes look like. Given the incomprehensible size of the universe, and the billions of galaxies and many more planets, perhaps there are planets out there with vistas like in this gallery. I really like this one Dawid. It`s often what comes to my mind when I think of space views that, for the moment, aren`t in any way attainable to our eyes but through imagination alone. Thanks for pushing my imagination further.